Rather sadly, 90% of Cologne was destroyed during bombing raids in 1942 The city hit by Allied forces a massive 262 times. 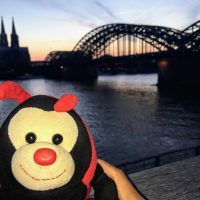 This makes Travel Bug very sad, but he’s pleased that it looks so beautiful now and that it’s full of bug friendly buildings and lovely German people. Cologne’s Old Town (Alstadt) has a total of 12 Romanesque churches scattered throughout its streets. All are Roman Catholic and none of them is just your average church. Travel Bug visited a few of them and saw how pretty they all were. They all have lots of art and priceless religious symbols inside. Travel Bug’s human Mum has his art on her fridge at home. She told Travel Bug that his paintings are almost as good. Travel Bug has heard of Eau de Cologne before. He knows it’s the stuffs in the cabinet in his bathroom that makes his humans smell a bit funny. What he didn’t know before doing his ‘spolorin’ was the perfume was invented in Cologne! Quite why he hadn’t realised this when the name makes it pretty clear, he’s not sure. Sometimes, he’s so busy thinking about when he’s due his next carne sammich that his little brain doesn’t have room for any other information. Food is more important than perfume, apparently. Anyway, the historic Farina House in the city is the place where the whole thing started. Travel Bug flew over to have a look at the iconic building that launched a million smells. ‘Water of Cologne’ was first produced back in 1709 and is called 4711 Cologne. Its ingredients are still top secret to this day. Do you have any other fascinating facts about Cologne for the Travel Bug?